Motivated by a desire to give back to his family, high school student Rolando was looking for work experience and a paycheck to afford things for himself like clothes, shoes and fun experiences for his siblings. In his words, Rolando has done some ‘not so great things’ in the past and wanted to make up for it by giving back to his family members. Rolando heard about CONNNECT2Career’s (C2C) School Break Externship program through his high school teacher. Students were encouraged to apply quickly since spaces were filling up fast. “As soon my teacher sent the link, I signed up,” says Rolando—this was the opportunity he’d been looking for. Rolando learned patience, how to react when the kids were not behaving and how to have conversations with young children. He expressed that working with the children at the Fleet Science Center was “much different from my home experience,” considering he has siblings that he helps care for at home as well. For Rolando’s spring externship, he was hired by C2C’s This Way Ahead program. He spent his externship hours making phone calls to program applicants and asking follow-up questions to see if they were eligible for the program. “I learned how to re-word things to make it sound professional over the phone,” he says. As a peer job coach, Rolando practices the skills he learned during his externships. For example, during his experience at the Fleet Science Center he learned how to ask questions and show his genuine interest in what the children had to say—a skill that comes in handy as he asks participants about their experiences and successes so that he can help them share those things on their resumes. In addition to gaining work experience and a paycheck, Rolando shared a few other key things he learned. He learned about taxes and how they can take a big chunk out of a paycheck. He learned about being adaptable in different work environments. 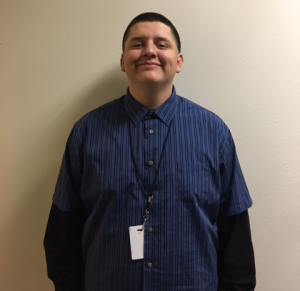 And, best of all, he gained “real world experience by getting up every day, going to school and then going to work afterward.” After high school, Rolando plans to go to school for counseling or business so that he can prepare to become a corrections officer. An initiative of the San Diego Workforce Partnership.